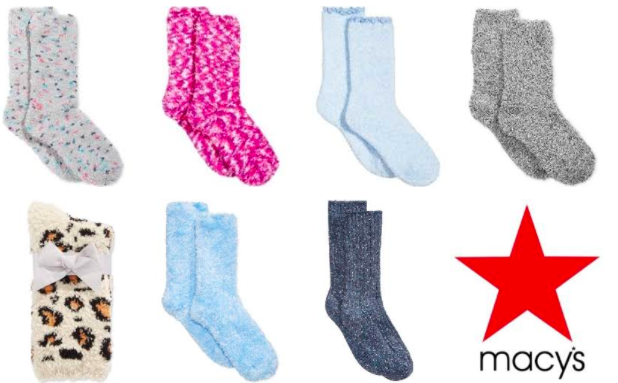 Why is it a big deal that SuperSoft Butter Socks are just $3.93 at Macy’s right now? Perhaps it’s because as I write this, we’re experiencing the coldest day of the season (and a record low for this year). As someone that works predominantly from home, I would be lost without my SuperSoft socks to keep me warm. I find I even wear them during the summer months because they protect my feet and are, well, super soft! But what caught me off guard this year was just how much the rest of my family started to fall in love with my SuperSoft Butter socks. I can’t imagine it was because they wanted to match my fashion sense: my teenage daughter would rather do anything than wear something her mom is wearing and my tween son doesn’t pay attention to what he’s wearing, other than to ensure he’s sporting gear from his favorite team. So when my daughter asked for her own pair of my “warm fuzzy” socks, and then my son asked to borrow a pair of hers, I knew we were on to something. The funniest thing about this story is that the first pair of socks my son borrowed from my daughter was the leopard print SuperSoft socks you see in the bottom left corner of the picture above. You knew he had to love them because in any other circumstance, he wouldn’t be caught dead wearing anything leopard print. I’m not saying he wore them outside the house, but he wore those socks every night to bed until I got him his own pair of blue socks. Trust me, you’ll want to get more than one pair of these for each person in your family because they’ll want to wear them every night, like my kids and I do. And with a price this low, you can afford to outfit your entire family in these socks for the entire winter. And if you’re looking for more cozy gear to keep warm this winter, Macy’s has you covered there too. From butter socks to opaque tights and pom beanies, you’ll find everything you need to keep you both warm and stylish on sale at Macy’s right now. Get your SuperSoft Butter Socks for $3.99 here.